Jerry White is a social historian and Visiting Professor of London History at Birkbeck College, University of London. He is perhaps best known for his trilogy of histories of London in the eighteenth to twentieth centuries. 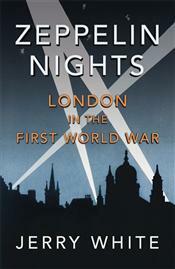 His latest book, Zeppelin Nights: London in the First World War was published by Bodley Head on 1st May this year. There have already been several recent additions to the literature of WW1 on the “Home Front”; Jeremy Paxman’s Great Britain’s Great War and Kate Adie’s Fighting on the Home Front, having been particularly widely reviewed. It is difficult to envisage that White’s exploration of the life of the capital city in wartime will be bettered, for its scope, detail, insight, narrative pace, and punctilious referencing. White’s particular skill is as an orchestrator of a multitude of sources, and Zeppelin Nights maintains the high standard of his previous social histories of London. The book serves well as a revelatory overview, but the Notes and Bibliography sections are especially valuable as entry points to research into the many aspects of London life the reader might wish to pursue. The air raids of May 1915 to May 1918, at first by Zeppelins and later by the more deadly Gotha and Giant bombers, form a recurring theme on which the book hinges. Other topics are also familiar: spy scares and anti-German sentiment; munitions work; prostitution; food and fuel shortages; conscription and appeal tribunals; anti-war dissent. However, the fresh facts that White reveals continually surprised me. For example, what proportion of the 750,000 British enlisted men killed or 1.7 million injured, were Londoners, is still unknown. The factual detail does not get in the way of some memorable scene drawing of the fear, deprivation and resilience of wartime civilian life in the capital. Thank you for this review of ‘Zeppelin Nights’. I loved Jerry White’s book of 18th century London. I had no idea that there was so much bombing in WW1 torn London. There was definitely something ‘off’ with the ruling and governing elite reasoning at the time, ie not giving pilots parachutes in case they lost their nerve and bailed out and refusing to accept there were limitments of human durance, often calling shell shock cowardice etc…..
Now I shall be able to see how that fits into context.